Nutty Putty is what cavers call a “sacrificial cave.” No animals are ritually killed or anything – it’s the cave itself that’s sacrificed by hordes of novice spelunkers (about 40,000 per year, I think I heard) who don’t know anything (or don’t care) about cave etiquette (like not touching sensitive crystals and other features, not leaving any trash, etc.). So while the cave takes a beating, at least it draws attention away from other caves. Not only does this protect other caves from abuse, but Nutty Putty is one of the safer caves around, with only one or two spots where a serious accident seems possible. About three years ago, search and rescue was called to Nutty Putty three times within a few weeks. 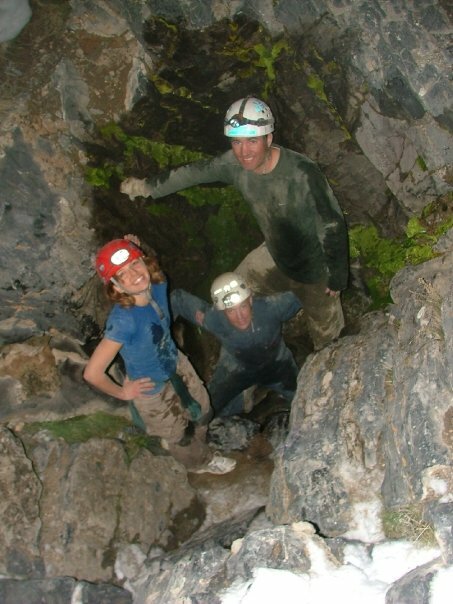 The cavers didn’t have serious accidents, they just got stuck. And stuck good! One got wedged in a tiny tube near a room called “The Scout Trap.” Only the smallest scouts can even fit in. I squeezed as far down as possible last weekend and barely got my ankles in before my shoulders wouldn’t slide any farther. 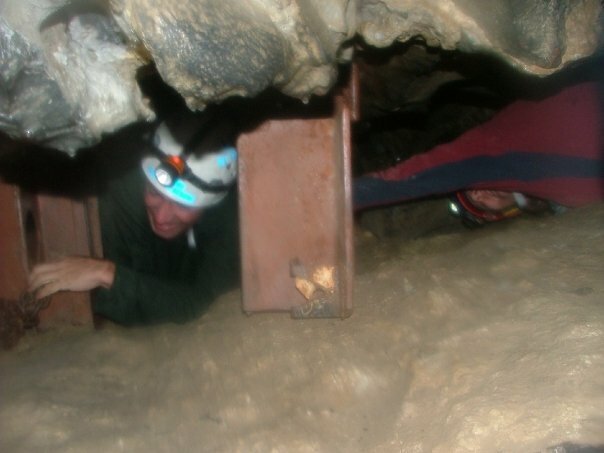 JUNE 2011 UPDATE: Nutty Putty Cave was permanently closed less than a year following this trip report due to a stuck caver’s death. Read the details about this failed rescue in the brand-new book 75 Search and Rescue Stories. Another was following two (smaller) friends through a tight spot, and when he couldn’t fit, his friends “helped” by giving him a little tug. This got his rib cage past the impediment, but his hips wouldn’t make it…and his ribs wouldn’t go backward. Shay Lellegren and I used an air-powered jack hammer (attached to a SCUBA tank) to remove about an inch of the rock, and then we were able to lift and rotate the boy enough to slide him out. The third call was a false alarm where a passing trucker (or someone with a CB radio) thought they overheard something about someone stuck (maybe a news report?) and we spent a couple hours checking out the entire cave to make sure there was no one there. There was talk of filling the entrance with cement due to liability concerns, but eventually Jon Jasper of the Utah Cave Grotto was tasked with creating an iron grate just past the initial squeeze of the entrance. So you can get into the cave, but you’ll only get a few feet before you have to turn around and leave. The doorway through the iron grate is about as small as any squeeze within the cave, and I wonder if anyone who fits through the cave entrance will fit through the door. This gate is locked with a combination that changes regularly, and you can make reservations and tour the cave for free! Find all details at http://nuttyputtycave.com/ You can also buy the very stylin’ “Nutty the Weather Bat” there to support cave expenses. Anyway. 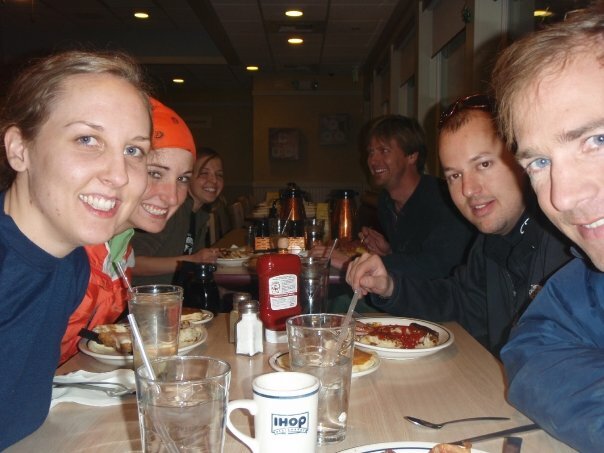 I went out there with Jon, Janel, Rachael, Curtis and Susie last weekend. It was nice to have the whole place to ourselves, not having to wait hours for our shot at the Scout Trap, Aorta Crawl, and other locations. After we got out, we had fun getting the 4Runners stuck in the snow (not mine, though, with its awesome new tires), and Jon generously bought us all dinner at IHOP. Not much to say about it other than everyone made great company and we all had an enjoyable day together. Next time you go in, if you find some D batteries, they’re probably mine. The end of my flashlight fell off and they fell out – and fell down, down, down. Though it was probably over 10 years ago, maybe they’re still there. Glad you had fun! During my freshman year of college some friends of mine found that Logan Cave was open and we all went through. It was a lot of fun – and nice to have it to ourselves. It was the first, and I guess the last, time I’ll ever get to go all the way to the end.